Annotation:After being sold to a cruel couple in New York City, a slave named Isabel spies for the rebels during the Revolutionary War. 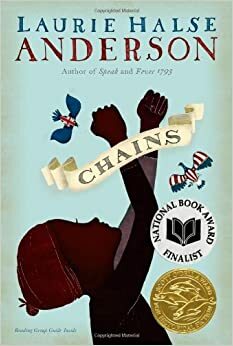 Summary: As the Revolutionary War begins, thirteen-year-old Isabel wages her own fight...for freedom. Promised freedom upon the death of their owner, she and her sister, Ruth, in a cruel twist of fate become the property of a malicious New York City couple, the Locktons, who have no sympathy for the American Revolution and even less for Ruth and Isabel. When Isabel meets Curzon, a slave with ties to the Patriots, he encourages her to spy on her owners, who know details of British plans for invasion. She is reluctant at first, but when the unthinkable happens to Ruth, Isabel realizes her loyalty is available to the bidder who can provide her with freedom. Isabel Finch thought she was getting her freedom upon the death of her master, as indicated in his will. Afraid not. Not when a man grabs her and sells her and her five year old sister Ruth to the Locktons. "Madam," as Anne Lockton insists she be called, took the liberty of renaming Isabel "Sal." Ruth, tortured by fits of epilepsy, a brain tumor, or some similar affliction, is treated as an ornament to be seen and not heard. And when she becomes too much trouble, Isabel must hide her in the basement. One day she disappears, and Isabel rages and runs away; Madam takes the reins and instructs the judge on which punishment she prefers to inflict. Madam elects to sear an "I" for Insolence into Isabel's cheek. However Isabel has a secret skill...she can read. And with her position in Madam's house, this skill has just become very valuable. With the American Revolutionary War fast approaching, and Madam's husband embroiled in the plans of the British, does Isabel dare to seek payback for her and her sister's treatment, and become...a spy? Isabel encounters a woman in the street singing "Yankee Doodle," and realizes that the woman is a messenger. What is the message? Colonel Regan gives Isabel the code wordad astrato use when entering the rebel camp. The word means "to the stars" in Latin. Why is this an appropriate code word for the rebels? How does this word foreshadow Isabel and Curzon's ultimate escape to freedom at the end of the novel? The bookseller gives Isabel a copy ofCommon Senseby Thomas Paine. He advises her that the words are dangerous, and that she should commit them to memory. At what point does she understand Paine's words? How does the book give her courage?